The people of Israel had been freed from the slavery of Egypt. They crossed the sea and the desert to stand at the foot of Mount Sinai, where they heard the voice of God Himself. At that Revelation, we received the commandments. We received the Tablets of the Law containing the famed Ten Commandments. That was the historic meeting, what Kabbalists considered the wedding ceremony of sorts, between God and the Jewish people. This is all documented in our Torah, in the Written Torah, that the Jewish people believe was dictated by God to Moses. There is an equally unshakeable, foundational belief that at that same divine encounter God also shared the Oral Torah with Moses. The Oral Torah is vaster, deeper and more complex than we can ever hope to grasp within a mortal lifespan. The Oral Torah, as the name implies, has been transmitted orally, from father to son, from teacher to student, since Moses until our very day. The Berdichever adds another dimension to explaining the transmission of the Oral Torah, that would seem to be counterintuitive and defy logic. His statement turns our conventional notions of timelines and cause-and-effect on its head. He explains that the Oral Torah that was given to us back then is based on the explanations and interpretations of our sages and righteous men of our own generations. 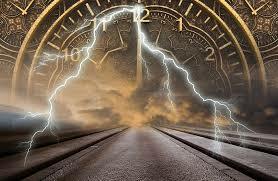 In a way that only God, who is independent of time, can accomplish, He is able to avoid any time-travel paradoxes or what we might consider physical impossibilities. God saw how the Jewish Halachic leadership of each generation would interpret and judge the Oral Law, and he took those formulations, principles and laws and transmitted it in some prototypical form, some kernel of basic truths to Moses, who then transmitted it through an unbroken chain through all of the generations since. It is then neither surprising nor contradictory when the sages develop and expand the Oral Torah in a way that adheres to the fundamental principles transmitted to Moses at Mount Sinai. The Berdichever goes on to demonstrate the power of the sages of each generation, that not only are they somehow the intrinsic source of the Oral Law that God gives us, but that their power in the divine realm is so great that in many cases, a truly righteous sage has the ability to actually veto God’s decrees. If God issues a harsh decree, a righteous sage has the power to annul God’s decree. That’s the power God has granted them. The Oral Torah is real, divine, unbrokenly transmitted, yet with an important and vital human component that interacts with and affects it on a daily and evolving basis. May we take it seriously. To Koren Publishing, on their new Spanish-language Torah transmission efforts.